The Boston Bruins have had an incredible season to this point, and their play in the month of March has been just about top notch. They’ve won 11 out of 15 games this month, and they’ve done it all with a slew of injuries to a number of their key players. Despite their decimated roster, the Bruins are neck-and-neck right now with the Tampa Bay Lightning for the top spot in the Eastern Conference. They handed Tampa Bay a 4-2 defeat on Thursday at the Boston Garden behind superb goaltending from Tuukka Rask in a game that featured goals from David Pastrnak and Patrice Bergeron among others. Currently trailing the Lightning by just one point in the standings, Boston can take back the top spot on Thursday with a win at home against the Florida Panthers. Thursday’s victory over the Lightning was a great team victory for this club. It was the second time the Bruins had beaten Tampa Bay this month, and they’ve proven that they aren’t intimidated by the only team that stands between them and home ice advantage throughout the playoffs. The only shame is that team captain Zdeno Chara couldn’t be a part of it, as he’s been out with an upper body injury for the last few weeks. It would’ve been great to have his 6-foot-9-inch frame and cheesy smile on the ice when celebrating that victory. And the fact that Boston just extended Chara’s contract for another year on Wednesday at $5 million plus bonuses, despite the fact that he’s 41 years old and his battle-worn body has been through 21 rigorous NHL seasons, just goes to show how beloved he is by the city and organization. There aren’t many current Bruins that are tenured longer than Chara (only Bergeron and David Krejci have been part of the organization longer). He’s been in the NHL since 1997, but he’s been a member of the Bruins, and their captain, since the beginning of the 2006-07 season. When the Bruins acquired the big man, the franchise was at a low point in their history. Looking to turn the organization around and get it back to its winning ways, Boston signed Chara to a five-year deal and immediately made him team captain. He was to be the centerpiece of their rebuilding effort; they wanted to build a championship team around this 6-foot-9 behemoth. 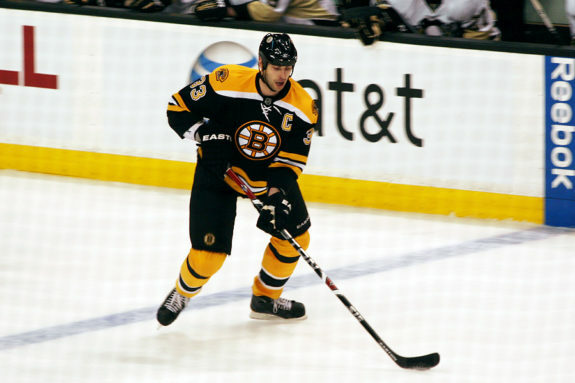 It took a few years to gather all the right pieces but it finally happened in 2011, when he captained the Bruins to a Stanley Cup Championship in a grueling seven-game series against the Vancouver Canucks. Credit for that championship season goes to a ton of different players but Chara was the one who helped turn the franchise around when it was struggling to win games in the regular season and getting the Bruins to the point where they were playing for championships. It takes a really special player to be able to do something like that. In all sports, many players get chosen to be the savior of a downtrodden team and try to make it a contender again. Only a handful of those players are actually able to do it. That’s one of the reasons Chara has become an iconic face in Boston, and one of the reasons why he means so much to the city. He sparked the beginning of a new era of Bruins hockey, and he did it with an Original Six team in a city with an incredibly rich hockey history. Not many players are able to say that, but Zdeno Chara is one of them. For that, he’ll be remembered in Boston by the fans and and the organization for a very long time. When you’re beloved by fans in Boston, some of the most diehard hockey fans in the world, you know you’ve really accomplished something. In the years since that magical 2010-11 season, and as Chara has aged, he’s continued to be a mentor to the younger defenders on the team, including Torey Krug and Charlie McAvoy, who will help keep Boston playing at a strong defensive level long after he hangs up his skates. Chara’s leadership on and off the ice is something that will leave a long-lasting effect on this organization. When most professional athletes reach the age of 41, they are usually retired. Chara is still going strong and he has enough left in the tank for at least one more NHL season. As long as he feels up to it — and you know he does — the Bruins are going to be more than happy to keep him around as their captain. The organization proved that with the contract extension. It’s impressive because he’s already spent two decades in the NHL, his body has been through a lot of grind and punishment, and of course, he’s not the same player he was 10-15 years ago when he was in his prime, even though he’s still one of the stronger defenders in the league. But his work ethic, his attitude as a pro athlete and his leadership both on the ice and in the locker room are things that the Bruins aren’t ready to part with. 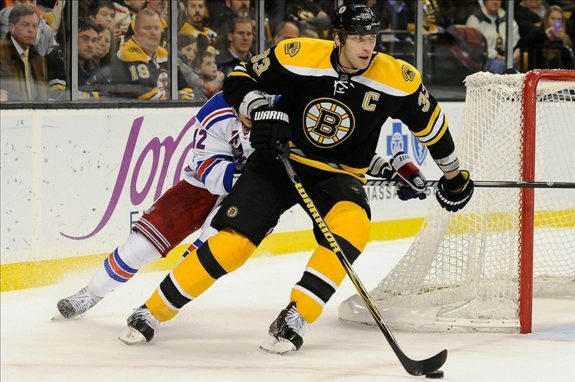 And Chara isn’t ready to give it up yet either, even as he continues playing further into his 40s. Chara is a one of a kind hockey player — the tallest player to ever play in the NHL, with the hardest slap shot, a tremendous defender, and as good a leader as any team could hope for — and the B’s are going to keep him around for as long as he wants to be around. He’s one of the all-time great Boston Bruins, and some day soon, his No. 33 will be hanging from the rafters at the Boston Garden. After 12 seasons and counting with this team, Chara has earned that. But for now, he’s still willing to play, and the Bruins and their fans couldn’t be happier about that. They get to watch one of the all-time greats in the NHL continue to be one of the best in the game. The city of Boston is known for its all-time great athletes: Bobby Orr, Ted Williams, Bill Russell, Larry Bird, Tom Brady, David Ortiz etc. 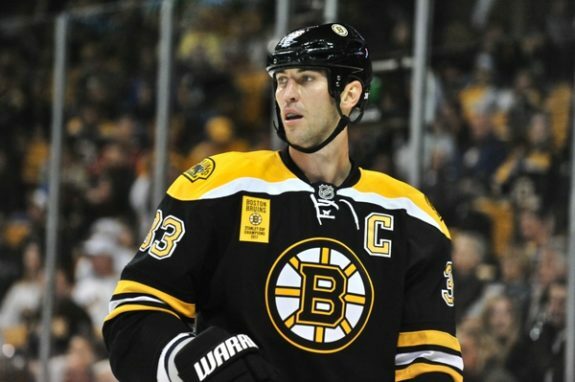 Zdeno Chara deserves to be up there with the best of them, and he is.